With each of our parrot adoptees, the Forever Wild Avian Sanctuary provides a set of guidelines that are helpful to the owner – as well as being useful in keeping the bird in a happy, healthy home environment. For a new parrot owner, there’s quite a number of do’s and don’ts, including household hazards that often prove fatal to a bird. Did you know that birds are particularly sensitive to airborne fumes and smoke? When heated, Teflon® coated cookware is extremely toxic to birds – and can kill them. Chemicals, paints, fabric softeners, carpet fresheners, colognes and aerosol sprays should not be used in areas when a parrot is housed. Wax candles should also be avoided. As a new companion and household member, adoption of a parrot is very exciting. However, the adoption process needs to be done thoughtfully. Our guidelines provide helpful hints about cage set ups and perch construction. Birds love their baths, so we have some bathing suggestions, too! A healthy bird also has variety in its diet. Seeds as a sole diet are deficient in essential amino acids, calcium and vitamins. Leafy greens, fruits, and pellets add variety. You can even do homemade recipes for nutritious bird foods! Before closing, I would like to mention another issue that our Sanctuary gets frequent calls about. A pet bird has escaped! Please do not leave windows and doors open that do not have screens. Many pet birds escape daily, and they are very difficult to recapture in the great outdoors. We are sometimes asked to help with the hunt and recapture of a pet bird. Unless eyes have been on the bird the entire time it has been outdoors, the probability of locating and recapturing is very low. For the lucky few, our Sanctuary sometimes receives a call about a found parrot. We will house such a bird and then attempt to find its owner. We are offering the Sanctuary’s “Guidelines To Keep Your Newly Adopted Bird Happy and Healthy” in PDF format for you to download. If you choose to print it, please use legal size paper that can be conveniently folded in half for future reference. Download the PDF now. 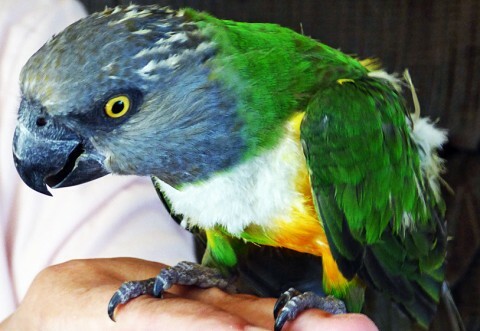 When we look at the magnificent parrot adoptees that come through our Sanctuary, what we want most is a good match between a prospective new owner and the parrot, as well as an informed owner. That combination will make for a long lasting and most rewarding relationship.